Don't let the size of "The Silk Roads" daunt you. It's very readable. The scope is huge, geographically and over centuries, but Peter Frankopan keeps everything clear and moving along. I lack familiarity with the history, so I can't say whether his arguments, his judgements on history, are true -- and what is truth? Probably if each of us studied the same scholarly texts we'd decide things a bit differently. But his arguments did hang together: the evidence he presents supports his insights. Frankopan has a nice style for a popular history book. 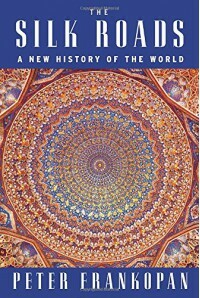 The scholarship is evident (and the referencing is great if you want to dig deeper with additional reading), but he wears it lightly and the wry sharpness of his judgement on the greed, violence, delusion and sheer stupidity of various individuals and nations/empires helps kick the book along. The complexity and good governance of the empire Ghengis Khan founded made for fascinating reading. Skip through a few centuries and the Russian factor in the decision to start World War I is one I hadn't read before (confessing my ignorance). Even the twentieth and twenty first centuries, where I thought I knew more contained surprises. "The Great Game", as the British called it, was never a game. Resources, wealth and security, power, religion and identity, mix to create a volatile region that impacts the world. I'm not sure I agree with Frankopan's conclusion that the world is turning back to centre on the old silk roads. That power shift to China, the belly of the old Soviet Union and the Middle East seems disputable from my corner of the world, Australia. And yet, there's now a train (or composed of several trains) that carries cargo from China across the old silk roads' spine. Maybe the upheaval in the Middle East, the terrible suffering of its people, is because of power shifting and players fighting to seize their opportunities, or to resist losing what they have. "The Silk Roads" is an interesting and absorbing read that lingers in the mind.